When I first heard about Surprise Trips, the idea instantly got me excited. Have you ever wanted to arrive at an airport and have absolutely no idea where you’re going? Pretty exciting hey! That’s the idea behind Surprise trips and they invited me to test out one of there new trip concepts. All you simply have to do is find a friend who is just as crazy as you are about doing such a spontaneous trip, pack your bags, grab your passport and sign up for the challenge. Creating your booking is, very simply. Go to the Surprisetrips.co.uk, fill in the dates you’re free, make your payment and await further instructions via email. Once you’re all signed up, your booking is then complete, which includes your flights and 3 star hotel. Everything else, such as Airport transfer, meals and activities will be arranged by yourself, which still gives you that added freedom over planning your trip. Currently destinations are selected across Europe, you can exclude up to three destinations (Great if you’ve recently been somewhere and don’t fancy a repeat visit). 3 days prior to your trip you will be given a cheeky hint in the form of a weather report so you know roughly what the forecast will be to help with your packing. Let the Surprise trip adventure begin! Always being up for an adventure, this was just the ticket! Off to Stansted airport I went. Little is revealed about where you’re off to prior to departure, it really is one big surprise. 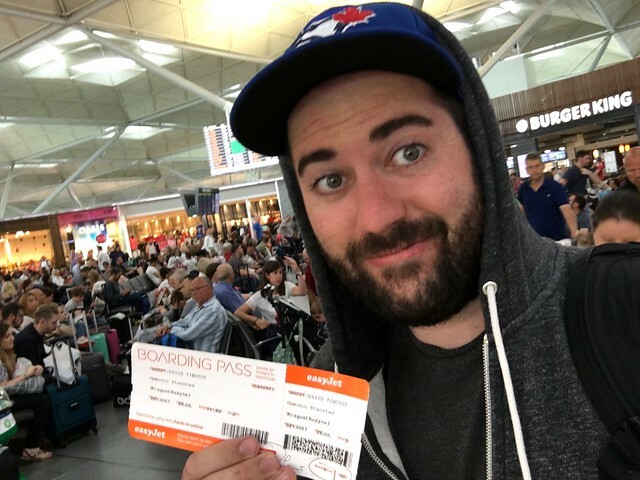 Once you get to the airport you can activate your email (Stansted has free wifi) Login to your Surprise trip email, which will be sent to you on the day of departure to reveal your mystery destination. I had a few ideas where I wanted to go, Reykjavik? Dbrovnik? All sounds lovely! You can check out the destination guide where you can possibly go to in advance. To be honest, I was more excited about the surprise and it didn’t really matter where I’d end up as long as I was going somewhere! Apart from Barcelona and Paris, the whole of Europe is your oyster, you can literally have no idea until Surprise trip reveals where you’re going. As I loaded up the email, it prompts a video, which then spins an Airport departure board and your destination is then revealed. Off to Prague, Czech Republic I go! Woohoo! Off to Prague, Czech republic I was going. Just like that I headed to the check in gate, got my boarding ticket and off I went. I found some time to quickly ask Facebook friends for tips on what to do. Googled how to get from Prague airport to the city centre and located roughly where the hotel was. In an hour I was all set and ready to check for tips once I landed in Prague. It’s pretty exciting going to an airport without knowing where you’re going, its a real thrill and adventure. With companies looking at kick-starting the next big thing in travel, this was a pretty awesome idea. The hotel? Hotel Rubicon, Prague. The great thing about Surprise trips is they will hook you up with a centrally located 3 star hotel. 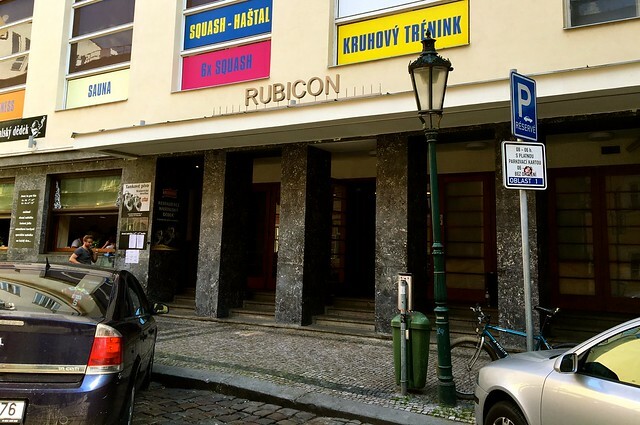 I couldn’t have been more happy with the location of Rubicon hotel, Prague. 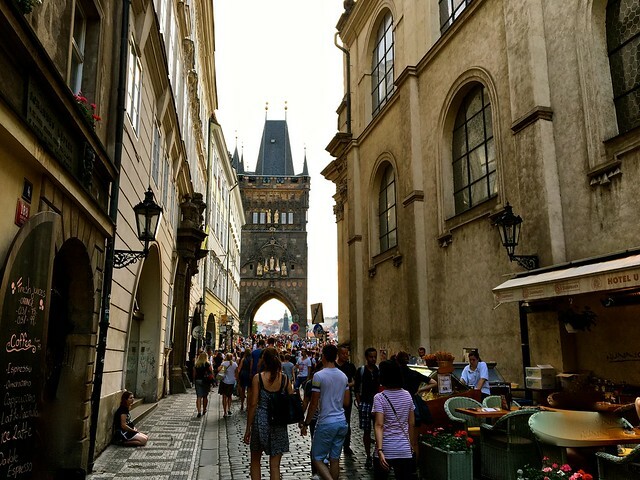 I was located in the old town, which was perfect for exploring Prague by foot. 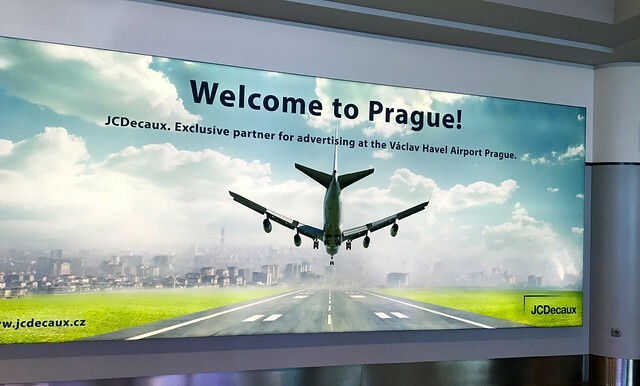 The Prague airport express bus drops you off close by as well which was an added bonus. 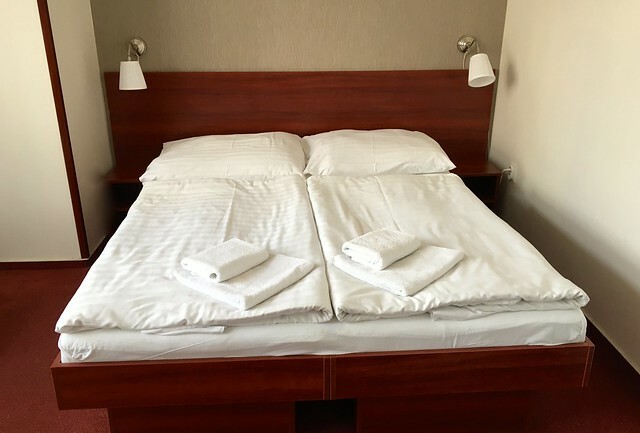 The room was perfect for two people sharing and I couldn’t have been more central, only 5 minutes walk to the old square, the heart of the action in Prague. Added bonus was that breakfast was included so you only had to worry about sorting out Lunch and Dinner, which brings me onto my next suggestion, Czech food! 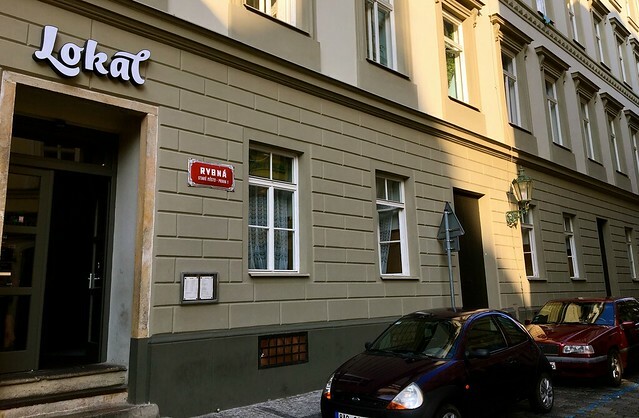 Funny enough, the hotel was located next to my favourite Czech restaurant called “Lokal” They have their own beer tanks containing the local Czech beer Pilsner equal. 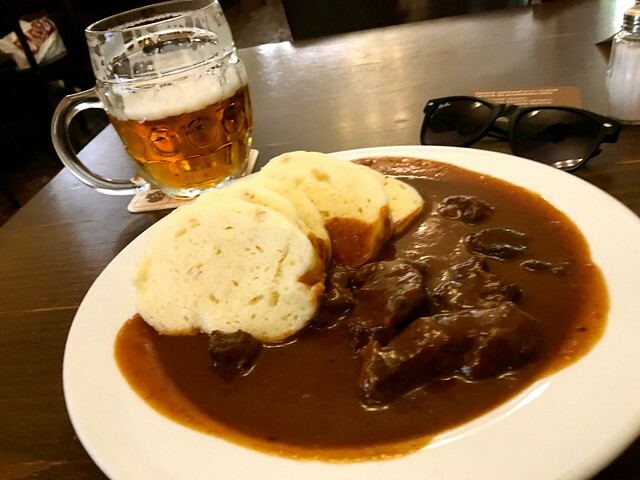 Within an hour of arriving in Prague I had a local beer in hand and a tasty plate of Czech goulash with dumplings. My favourite part about this spot apart from the great beer hall like atmosphere is when the friendly waiters ask if you want more gravy or dumplings when they notice you’ve run out. Yes, please! 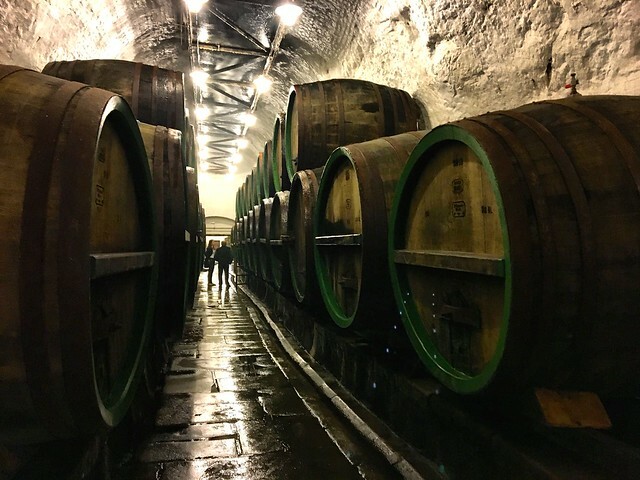 It’s a great spot to check out in Prague and a perfect introduction to Czech cuisine. 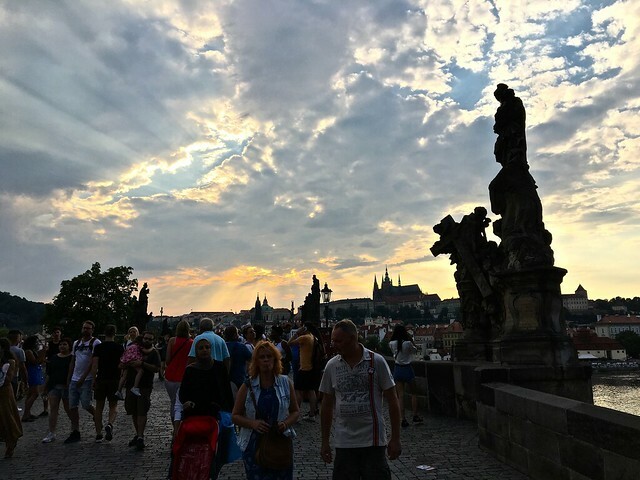 Just as the sun starts to set around 6ish is the perfect time to walk around and explore Prague. Simply get lost and you won’t be disappointed. 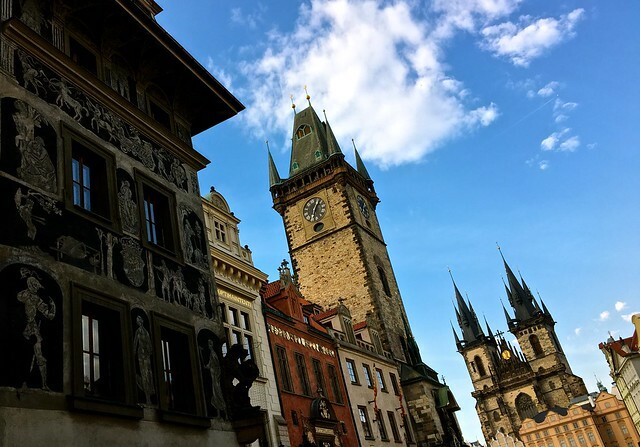 Prague has an incredible medieval gothic architectural feel which will make your jaw drop on every corner. Watch as it starts to get darker and the whole city starts to transform, its a fantastic city to get lost and explore. Ice cream in a donught? 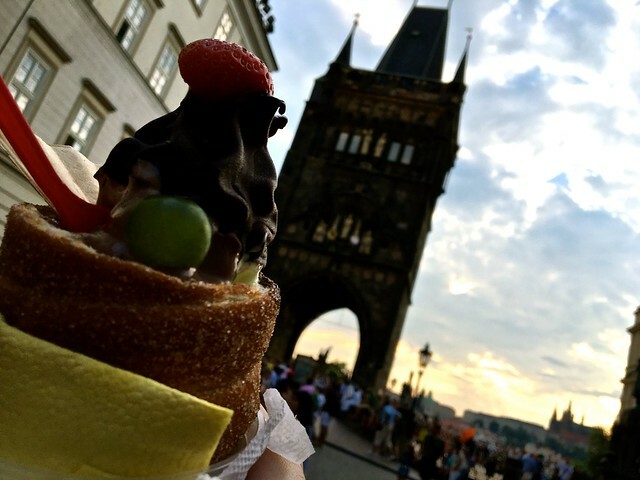 Since my last visit to Prague I’e kept on seeing ice cream in a donught popping up across instagram feed from vistors to Prague. I had to investigate further into this new tasty phenomenon. 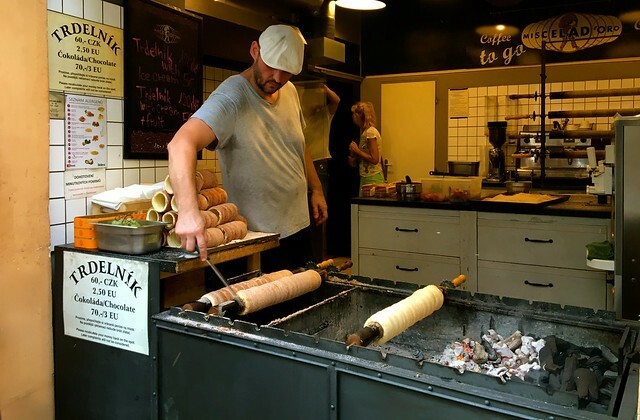 Its actually a traditional Czech style of cake called a chimney cake that’s been created from a wrapped dough, that’s then grilled to perfection over a hot coal grill and then swirled into cinnamon and brown sugar. 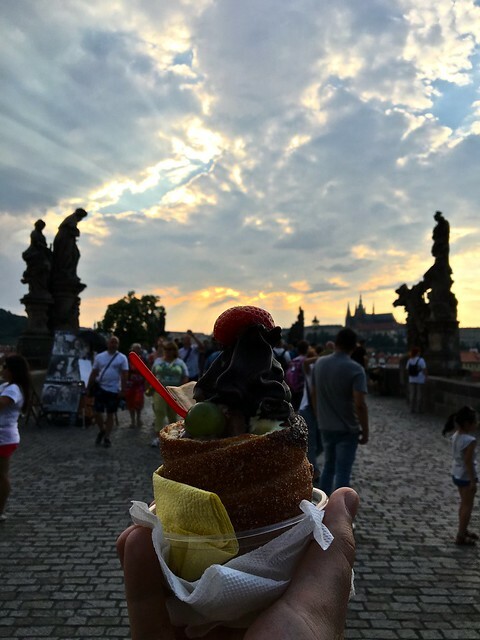 Some smarty pants thought it would be a great idea to add ice cream in the middle and this Czech treat was born. It’s since exploded in popularity amongst visitors. A perfect example of fusion food and totally worth it if you have a sweet tooth like me. 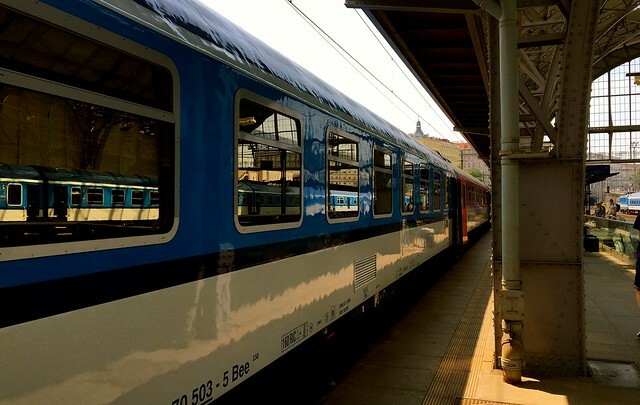 Prague is a wonderful city to explore, but with a day to spare, I thought it would be fun to go on a day trip to a close by city on the handy rail network. 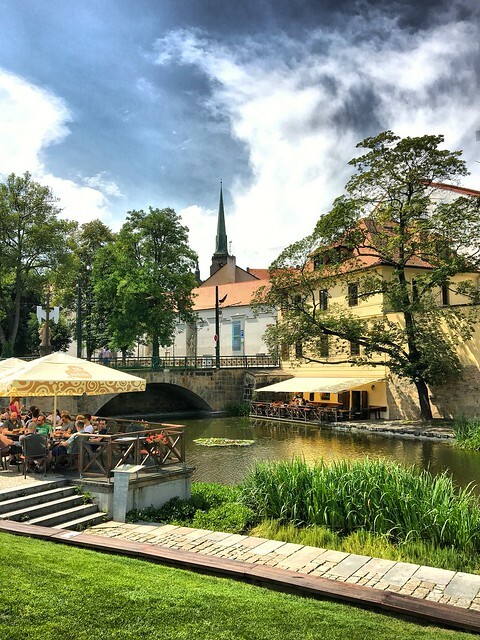 I’ve always had a visit to Plzen on the radar ever since it was the capital of culture in 2015 and this made a perfect opportunity to sort out a day trip. 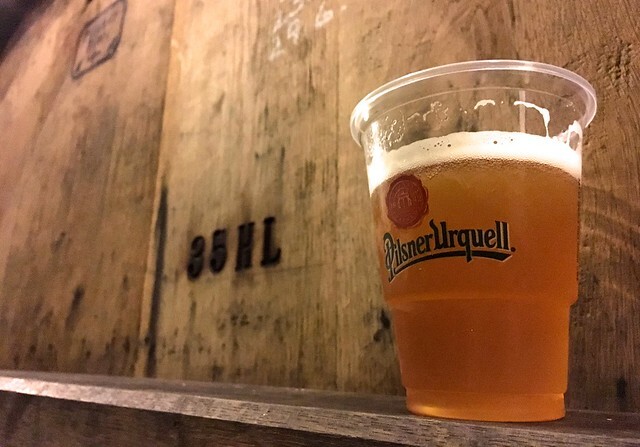 Pilsen is considered as the home of beer and as a big beer fan I decided to go and visit the popular beer brewery tour at Pilsner Urquell. After the tour Plzen itself is a stunning little crazy town to explore and get lost around, very awesome indeed! 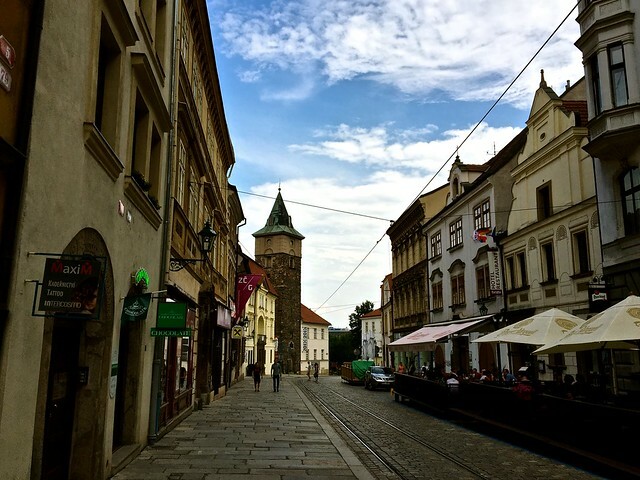 Along with the day trip to Plzen, the whole trip to Prague was a real surprise. Your hotel and flights are all sorted but everything else is up to you giving you a lot of freedom and flexibility to still be in control of your trip. With a surprise trip it’s a real adventure and I can’t wait to hear back from your own personal trips on where you ended up and what you ended up doing. Thank you for reading my blog post about Surprise trips! 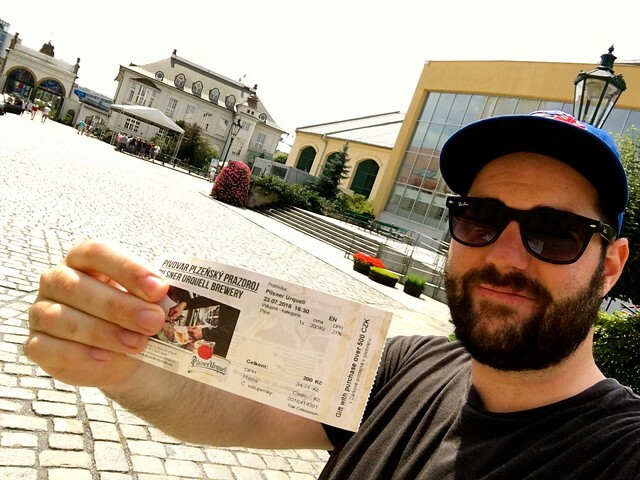 Thank you for reading my blog post all about how to sort out your first mystery adventure with Surprisetrips, I hope you found it useful and wish you all the best with your next mystery adventure. You know you want to give it a try! Go on, I double dare you. If you do have any further questions about Surprise trips they do have a very fancy and helpful Surprise trips F.A.Q page as I’m sure you still have an endless amount of questions. I’m also very happy to help if you can’t find an answer to what you’re looking for. You can leave a comment below in the comment section of this blog post and I will help you out straight away. Happy travels everyone and I wonder where your next adventure might take you?